Reclaimed bottles are a free and versatile material for edging paths and beds. Here are some useful tips for creating bottle-beds in your own garden. A few months ago, reading a garden design book, I stumbled upon the terms ‘masses and voids’. I’d already identified that my garden looks a mess because there are so many ‘non’ areas butting up against the designed and intentional elements. I realised that the solution is to design the voids. The masses will take care of themselves, since they are trees or bushes or rustic duck houses or whatever, and tend to be the nice bits. My focus for improvement needs to be the gaps in between – mostly the paths. There was also the issue of drainage. We’d had a lot of rain. I’d installed two innovative but amateur rainwater harvesting systems, both of which are unfinished in that the ingress of the rain is complete and functioning but the egress is still largely at the concept stage. The upshot of which is a lot of water on the ground. I’d dug what I rather romantically call a ‘swale’ at the top of the garden, running across what I like to think of as a ‘contour’. 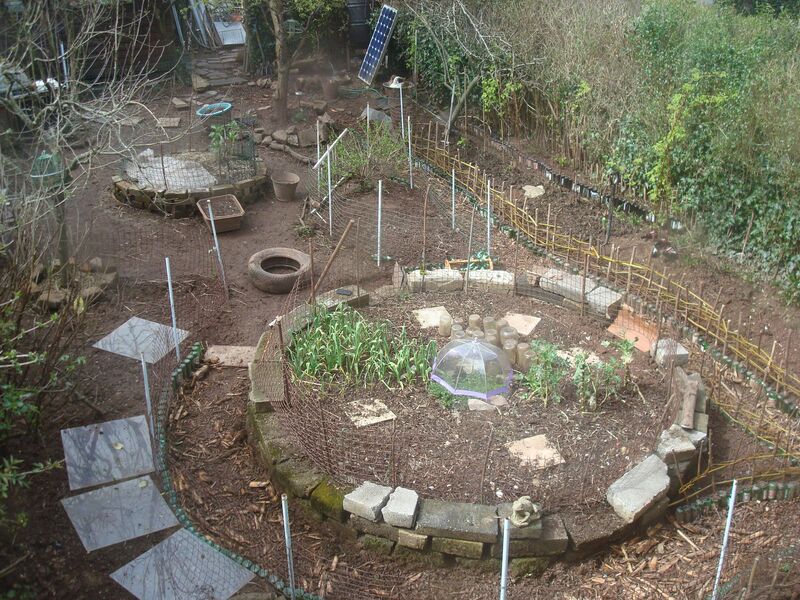 Actually the garden is too small and too level for contours, but the idea is to trap the run-off from up above the site. It does so, but there is nothing like actually doing something and seeing the results to identify its faults. Because the main run-off from up by the garages comes down the path and enters the swale at the entrance to the garden, which continues as the main path down through the garden. So what was actually happening was the bulk of the water was being retained by the soil under the path instead of under the growing beds, and once trodden on this makes the path pretty slushy. So the creation of the paths and the installation of a drainage system needed to be incorporated into one design. Where the paths run widthways, they can be treated as a shallow soakaways, with a loose layer of drainage allowing water to filter through quickly – in this case into the soil below. We dug out a few inches of topsoil to use on the beds, then infilled with shredded prunings from the apples, buddleia, forsythia and unusable willow. There wasn’t enough material, so when urban hacktivist Florien Riviere arrived to spend the week WWOOFing, he was delighted to make multiple trips to a council verge where they had dumped their shreddings from – what smelt like – Christmas trees. The main path down through the garden poses a particular drainage problem. It runs lengthways rather than across the contour, it drains the garage run-off as mentioned above, and it also gets particularly compacted. So while we used basically the same method – topsoil removal and infill with wood-chip shreddings – I also created a slight camber to encourage the water to drain towards the beds and borders. Here you can see the difference between the path where we were stomping about making the beds, and where the wood-chip path has been created. The worst that happens now is that it feels a bit soft underfoot after heavy rain. The mulch will need topping up occasionally and, when rotted down, may eventually need digging out, adding as a surface mulch to the beds and replacing with fresh chippings. This is harder work than paving or concrete, but even without the environmental considerations of concrete, it’s not safe to use with the ducks. Wet duck poo is incredibly slippery. Like this, there is also ample scope for changing the course of the paths as plants grow and access is required in a different place. This is also the beauty of using old bottles for edging the beds. The bottles are free, reasonably decorative (my preference is for using a uniform colour), can be arranged in any pattern, easy to install – either incrementally or in a big batch, fairly easy to move again, don’t take up much space and do not rot. A rubber or wooden hammer is the only tool you’ll need, and possibly a piece of board or plank the same width as the bed. Obviously you’ll have some idea of where you want the path to go, and it isn’t necessary to mark it out entirely – although winding a hosepipe or two in the proposed pattern would give you the chance to try out the path for size and route. Smooth curves are good or you’ll be tempted to cut corners – and sometimes it just feels ‘wrong’ for no apparent reason. I found it impossible to visualise the path until the bottles were actually in place – so I used marker bottles a few yards ahead, and kept viewing it as if I were approaching from different directions and angles. There are two main decisions you’ll need to make early on. Firstly the type of bottle. You need ready access to an adequate supply (using blue gin bottles would be very pretty, but rather slow and horribly bad for the liver), and they also need to be the right shape. Wine bottles might work, but the neck needs to be quite long in proportion to the body of the bottle, so that they stay firmly in place without toppling over. 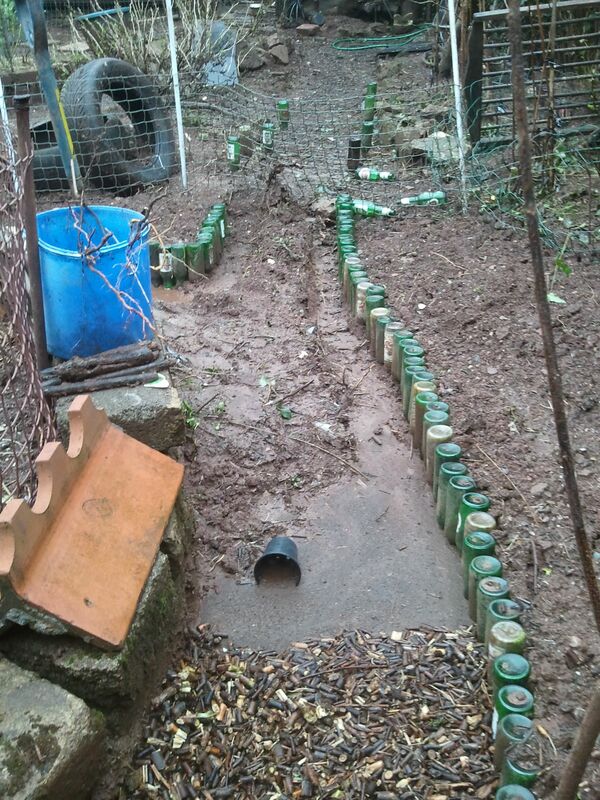 The temptation might be to use taller bottles and build the beds up considerably deeper than the paths, but I don’t really think bottles are up to being retaining walls.Squat little stumpy bottles won’t work as the necks are not long enough. 1 pint beer bottles would be great, if you have a supply. My supply was 240ml Stella and 270ml Grolsh, which I use interchangeably without noticing the difference. The width of the path is one of the most important decisions. You can make narrow little paths, but they look mean and can feel weird to use – although this might depend on the size of your garden (and yourself). If you carry big stuff through or use a wheelbarrow, you’ll need large enough paths to accommodate this – and remember that shrubs and bushes will overhang as they grow. I also have a concrete path outside the garden which is used by tradesmen and callers and I can use as an alternative. I also don’t use a wheelbarrow. So I made mine an easy hip-width with my arms dangling at my sides, and that looked in scale with the garden. In places it has worked itself narrower, and which I’ll probably widen eventually. Once you’ve decided the width, you need to add to this the diameter of the bottles – which will make it look too wide once you start digging. Just accept this. It’ll work out better than starting with a path that looks right then filling it with bottles. You don’t want to dig any deeper than the topsoil, but if your soil is in good nick, even that might be rather a lot. Weigh it up between how much time you’ve got, how much mulching material for the paths and how deep you need the soil to be on the beds. I made the beds slightly deeper than the paths mainly because I didn’t have sufficient mulching material. The bottles seem to be holding in place so far, but if they begin to work loose over time it would be possible to fill in the paths a bit deeper. Theoretically the bottles only need to protrude enough to keep soil and path materials separate. I needed a bit more definition because the ducks peck around at it.